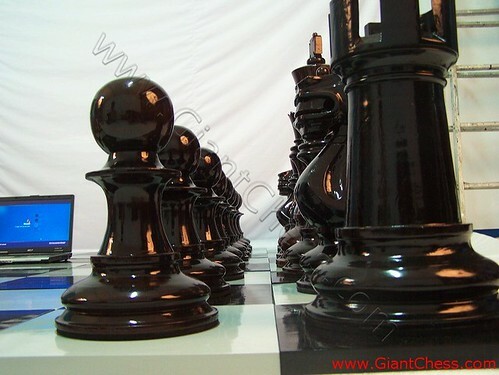 Black and glossy look, those chess pieces on the picture above are sized in 24 inch. Big enough for chess game at garden, camp, villa, beach and another outdoor area. Children and adolescents especially love these pieces, and they are still not too large, nor too heavy, to be taken with you wherever you should wish to play. Even if kept permanently outdoors, in yard or garden, because they are of teak they can withstand any weather. The chess set above has made from best quality of Teak wood. We choose qualified Teak wood to make it durable in any seasons and weather. Those pieces are carved by expert craftsman and make it looks unique and worth as handmade product. Polished well in black, make it so elegant. Get also the brown chess and enjoy your outdoor game using our wooden 24 inch chess set.